Hamid Karzai's first choice cabinet nominees were mostly rejected by Afghan lawmakers. 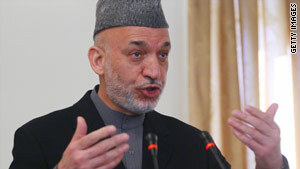 Kabul, Afghanistan (CNN) -- Afghanistan's President Hamid Karzai attempted once again to solidify his administration by presenting a new batch of Cabinet nominees Saturday, a week after parliament rejected a majority of his first choices. Included are three women to lead the ministries of public health, women's affairs and public and social affairs. Karzai offered 16 new names, one less than the 17 rejected by parliament last weekend. Cabinet selection comes at a critical stage for Karzai. He is under pressure to stamp out widespread corruption in Afghanistan and establish legitimacy for his administration -- tainted by allegations of vote fraud last August -- both at home and abroad. Members of parliament did not approve of nominees on the initial list who were viewed as corrupt or unqualified. Among them was Ismail Khan, a powerful warlord who was tapped to lead the ministry of water and energy. Vice President Abdul Karim Khalili read out the names on the second list and lawmakers will be briefed by the president's office on the nominees. No date has been announced for a parliament vote.